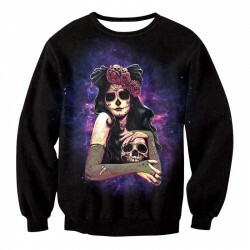 Black Magic Girl with Skull SweatshirtPlease see sizing chart for exact size.Item specific..
Sugar Skull Purple and Blue Flower Girl SweatshirtPlease see sizing chart for exact size.I.. The Nightmare Before Christmas Jack & Sally Sugar Skull SweatshirtPlease see sizing ch.. The Nightmare Before Christmas Jack & Sally SweatshirtPlease see sizing chart for exac..